Kathleen Bennethum actually went to school for nursing. While she was going for her nursing degree she also took classes in metalsmithing, drawing and pottery. Then one day her mom was diagnosed with Alzheimer's disease and in the same year hery son was born. She knew she needed to be home for both of them so she dug out all her old metalsmithing tools. She started taking metalsmithing classes again and realized how much she loved working with metal. 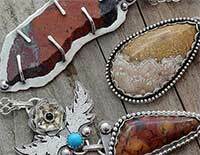 Most of her work today is created using traditional metalsmithing techniques. She feels truly fortunate that jewelry making has allowed her to stay at home with her family.